At issue in the Book of Job is a question with which most all of us struggle at some point in life, “Why do bad things happen to good people?” James Crenshaw has devoted his life to studying the disturbing matter of theodicy—divine justice—that troubles many people of faith. Few individuals come from reading Job unmoved. If they seek answers, they likely will be disappointed. And, many find the depiction of God troubling. If God were merely to meet our expectations, the Creator would hardly be anything more than our own projections into the heavens. Perhaps the ancient poet serves readers best by starkly portraying the brutal reality that life and this world are not fair, and that justice is a human project. James L. Crenshaw is Robert L. Flowers Professor Emeritus of Old Testament at Duke University. Widely published, he is one of the world’s leading scholars on Old Testament study, focusing especially on wisdom and poetry. Crenshaw's study of Job is rich in insight and a brilliant contribution to scholarship. As a renown scholar in the interpretation of wisdom texts, this volume should be found on the bookshelves of every biblical scholar who is interested in wisdom literature and the interpretation of Job. 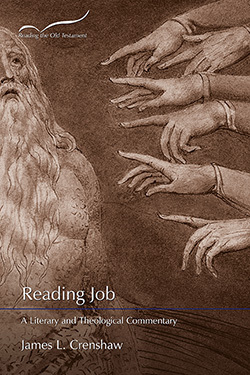 Excellent commentaries on Job abound; Jim Crenshaw’s “reading” of Job adds to the list and raises the bar. If contemporary readers wish to enter fully into Job’s world, his irreparable losses, his relentless questions about the moral order of the universe God has created, they can find no better guide for the journey than a commentator whose expertise, artfulness, and eloquence are acutely attuned to the admonitions of Shakespeare’s King Lear: “If thou wilt weep my fortunes, take my eyes.” Crenshaw has read, felt, and immersed himself in Job’s fortunes with eyes and heart chastened by a world overfull with inexplicable suffering that continues to claw at the heavens – Joban-like – for justice. Union Presbyterian Seminary, Richmond, VA.
James Crenshaw is the preeminent interpreter of biblical wisdom in this generation. His work is distinguished by his deep existential concern, especially on the subject of theodicy, which is at the heart of the book of Job. This is a work not only of exegesis, but of biblical theology in the best sense. Like Matthew Arnold in “Dover Beach,” Bertrand Russell in “A Free Man’s Worship,” and Archibald MacLeish’s J.B., James Crenshaw’s Job finds solace for his integrity, not in a god who answers to human trust, but in human solidarity in the face of a cruel world. This book about Job is itself a Joban cry. James Crenshaw, one of the foremost scholars of wisdom literature, brings over forty years of scholarship and teaching to bear on his reading of the book of Job. Respected not only for the breadth of his knowledge but also for the passion with which he explores difficult theological questions of human suffering and divine justice, Crenshaw has written a commentary marked not only by careful exegesis but also by deep insight into the many perennial issues raised by the book of Job.